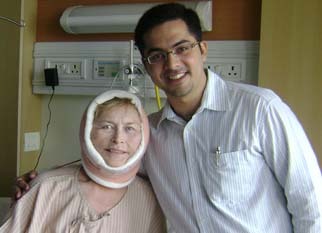 American Lady’s Multiple Cosmetic Surgery In India. I am Lou Anne and I am from the USA. I came for my body lift and facelift surgery in India through Forerunners Healthcare Consultants in India. Forerunners Healthcare Consultants is a renowned name in America in the field of medical tourism in India. I have read lots of articles about the excellent services and facilities provided by Forerunners Healthcare Consultants in India. I contacted Forerunners Healthcare Consultants in India and submitted my details to the representative of the company. And I contacted Dr. Dheeraj Bojwani the head consultant of the company and had a discussion regarding my body lift and facelift surgery in India. I got my cosmetic surgeries in India arranged through Forerunners Healthcare Consultants in India. In India my surgery was booked in the best cosmetic surgery hospital in India associated with Forerunners Healthcare Consultants. The hospital was very nice with wonderful environment. The staff of the hospital was very nice and caring the took care of me perfectly during my stay in the hospital. It is a quite early to tell about the results after my surgery. But I can feel that I have got a makeover for my self. And I would like to mention this specially that if you need the best medical facilities and treatment at a reasonable cost in India it is only possible with Forerunners Healthcare Consultants. I am very happy at my decision of coming with Forerunners Healthcare Consultants for my Body Lift and facelift surgery in India.